Whether you are a female drooling over him or a male that is inspired by his fashion, it's safe to say that David Beckham has the attention of both genders. When this soccer player is not in uniform he is most certainly dressed to impress. He even looks presentable during his casual bummy days. David is usually spotted with a beanie and sunglasses for a fashion statement which also serves to hide from paparazzi. But here he is a simple and casual denim outfit paired with a grey sweater tied around waist. And guess what fellas? 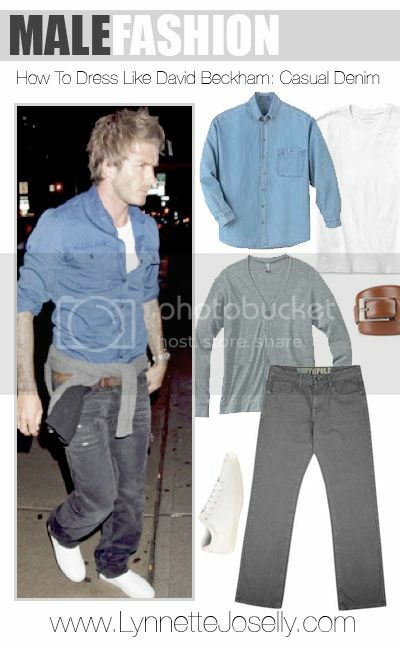 You too can dress like Mr. Beckham himself without making money like him. Shop the look below at a more affordable price.